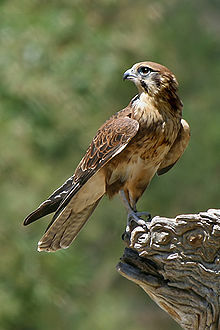 Falcons are small birds of prey and are related to hawks and eagles. They usually have pointed wings and long tails. Most falcons eat small mammals that they hunt using eyesight, although some species hunt other birds, which they take in flight. Like hawks, most falcons have dark gray or brown backs and wings, with white undersides. The peregrine falcon is found over most of the world and is famous for hunting birds by diving down on them at 320 km/h (200 mi/h). It was nearly wiped out in North America by the use of pesticides, but has since made a recovery. On the Moroccan island of Mogador, falcons seem to imprison small birds by trapping them in crevasses, presumably saving them to eat later. Mogador has the ruins of a fortress, a mosque and a prison. Today the island is a nature reserve, where Eleonora’s falcons nest among the ruins. They hunt migrating warblers, hoopoes and other birds. Researchers came across small birds trapped in deep cavities, their flight and tail feathers removed. The birds were unable to move their wings or use their dangling legs. Eleonora’s falcons have been seen building up larders of up to 20 dead birds during migration season, when prey is plentiful. But "storing snacks that are still alive could be a unique behaviour" said an expert. This page was last changed on 20 June 2018, at 15:04.